Best glue for carbon rims. I've used a number of different brands throughout the years. Even tried tube tape. 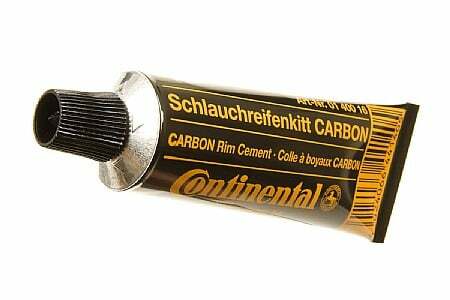 Continental is the best, and the special one for carbon rims works noticeable better for carbon rims. This is my preference for gluing on carbon road rims, it does not dry as quickly allowing for more adjustments during the install process. It is removed very easily with a heat gun (very little heat is needed) and does not remove the basetape from a tire. The bonding strength is not as strong as mastik, therefore i do not use this for cyclocross applications. Easy to apply out of the tube, one tube is enough for two new tires. Just right , no dipping brush into can. No mess. Sqeeze & spread !